Goalkeeper Jonathan Bond was awarded the sponsor’s man of the match during Peterborough United’s 3-2 home defeat to Blackburn Rovers this afternoon (Saturday, December 9). The goalkeeper saved well from Bradley Dack in the first-half and kept out the rebound alongside Jack Baldwin, and he made a superb stop to deny Marcus Antonsson, but he was powerless to prevent Dack (twice) and Charlie Mulgrew from giving Blackburn the win. 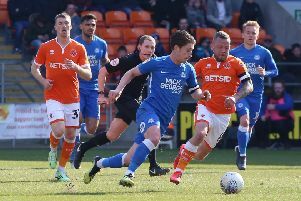 Steven Taylor and a late Jack Marriott effort were in vain for Posh who were ruthlessly punished for individual errors.